What could be simpler or more satisfying than an assortment of (room temperature) cheeses, a handful of nuts, and some sliced fruit? Add a few more items if you want a rounded meal, such as crudités (raw veggies) and perhaps cold, leftover chicken. And grilled bread, yum! Here is a cheese platter from the lovely Vinoy Hotel Resort in St. Petersburg Florida. But you can easily duplicate it at home. In the summer heat, who wants to labor over the stove, or grill, every night anyways? And what a treat they can be, when cooked properly. That is no easy feat, it seems, because at least half of the times I've ordered them in a restaurant they don't achieve their full potential. I've tried them at home, too, and with decidedly limited success. 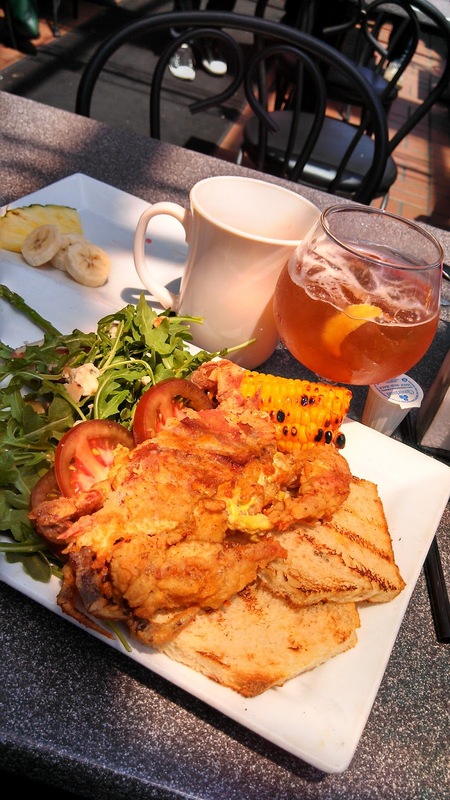 If you live in Cincinnati (as we do), the best I've had are at Otto's in Covington. 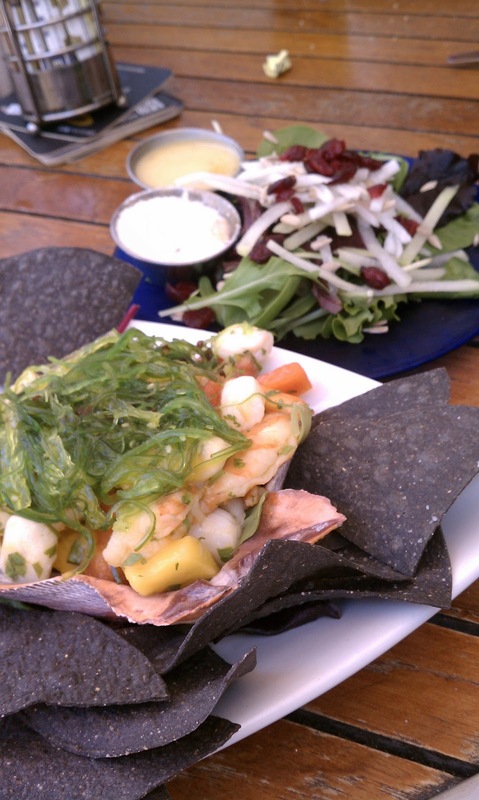 They know how to make them greaseless, with a crispy exterior and juicy/tender on the inside. We were just in Washington DC, where we had quite good (if not perfect) soft shell crabs at Kremer's Bookstore and Cafe on Connecticut Avenue near Dupont Circle. 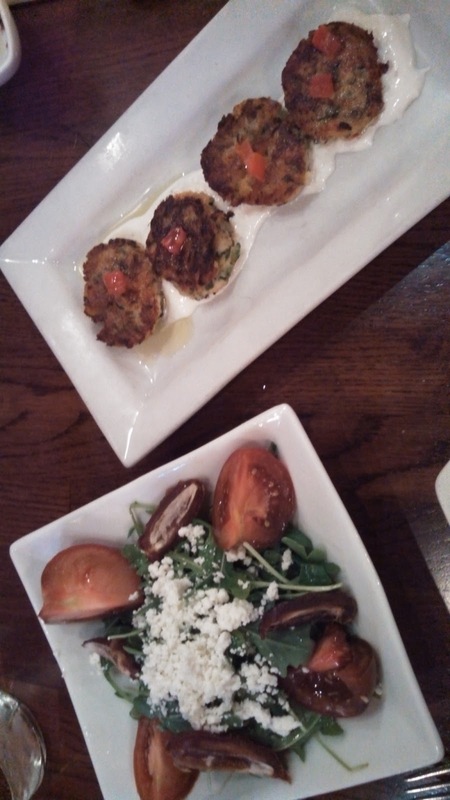 Another delicious meal was at Angola (in the same neighborhood), an upscale (but reasonably priced) Greek tapas restaurant at 17th and Q Streets. Here's a photo of a couple of plates -- the zucchini pancakes were especially good. 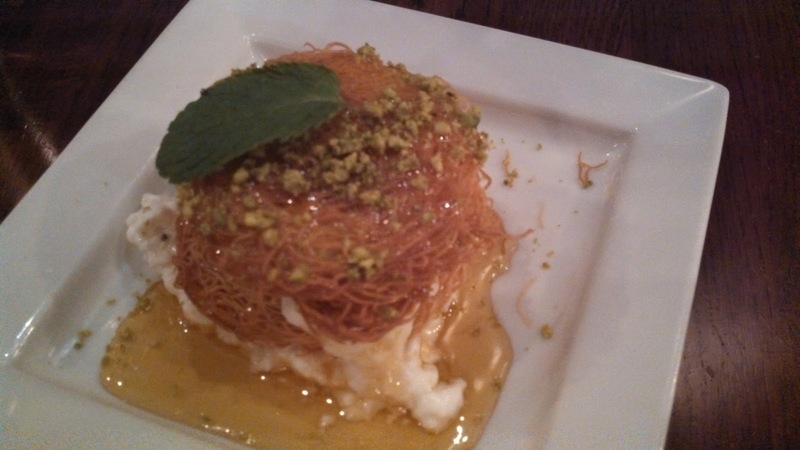 The dessert -- crumbled phyllo with honey and vanilla pudding -- was even better. Dark chocolate isn't just delicious, it's also good for you (assuming you don't pig out on the stuff). I also really love chocolate with nuts, a marvelous flavor combo. Here's an easy recipe for chocolate pudding that my friend and colleague Mary Ann Barnes devised and shared. It uses walnut oil for that chocolate/nuts thing. She says it's so tasty that your guests (family, friends, or whoever) won't know that it's actually healthy, too. Beat egg yolks with ¼ cup sugar until light. Whip egg whites with remaining ½ cup sugar until forms soft peaks. Meanwhile, melt chocolate chips in a medium bowl, stopping to stir frequently, about 1 ½ minutes. Be careful not to burn. Add walnut oil and stir until smooth. Stir in brandy and egg yolk mixture. Add chocolate mixture to egg whites and beat until smooth. Divide into individual dishes and refrigerate until served. Garnish with fresh berries. 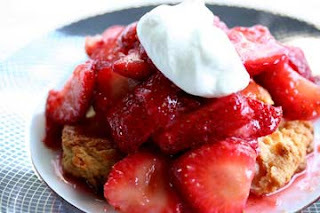 Eating Well magazine did a great makeover of a too-heavy strawberry shortcake recipe, trimming 100 calories and loads of sat-fat from the recipe they started with. Here is the lightened version! 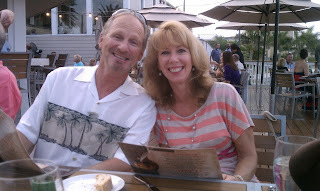 Spent a few days in St. Petersburg Florida to attend my brother's wedding. At 60-- after a disastrous first marriage to the wrong person, an acrimonious divorce and more than 5 years of frustrating dating--Paul found his true love, Katharine. I have never seen him so happy. What a wonderful thing to behold their mutual love and joy! Here is a photo of the bride & groom on the evening before their wedding day. 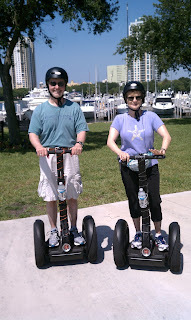 My husband and I managed to take a two-hour Segway tour of the waterfront in St. Pete. Those things are so much fun! Our next trip is to Washington DC and we intend to see the sights on two wheels there, as well. Our dining highlight was dinner at the famous Bern's Steakhouse in Tampa. The only food photo I have to share is of some delicious shrimp-and-scallop seviche when we lunched at a sidewalk eatery in St. Pete. We stayed at the lovely Vinoy Hotel -- a place to which we intend to return. Back to more typical posts soon. You can call this risotto but I cooked the rice separately, so maybe not. It's still delicious, and much less labor intensive than true risotto. As always, the quality of the ingredients makes all the difference. 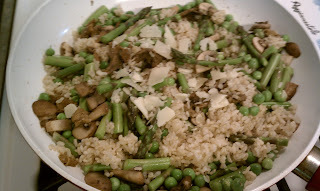 Local asparagus, English peas shelled from the pods, and a small amount of chanterelle mushrooms (along with "baby bellas") were the flavor stars here -- all enhanced by good quality shaved Parmesan cheese and a healthy shot of garlic. Make the veggie melange, stir in the pre-cooked brown rice (Trader Joe's has frozen brown rice that you microwave, super easy and delish, too), top with the cheese and voila! Yummy. I did this free form and will try to reproduce the recipe here. Substitute fresh morel mushrooms if you can get them. Heat oil in a large frying pan over medium heat. Add mushrooms and stir-fry until they begin to brown, about 4 minutes. Add next 5 ingredients (peas through stock) and stir-fry for 3 minutes to blend ingredients. Cover and cook another few minutes until veggies are crisp-tender. (Test with a fork, or try a piece of asparagus.) Stir in rice and cover again. Cook just until the rice is heated through, probably about 3 minutes. Remove from heat and add cheese; adjust seasonings and add more salt and pepper, if desired. 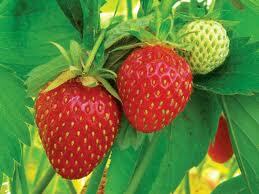 We don't have to wait until the summer or fall harvests to feast on incredibly healthy, locally grown, in-season foods. Local asparagus (now available at Findlay Market and others) and strawberries (still a couple of weeks away, most likely) taste way better than anything from the supermarket, but there are several other great foods that are being harvested now and available at local farmers markets. 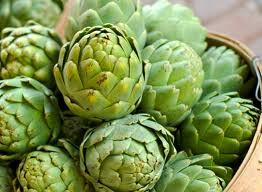 They include kale, fennel, spinach, leeks and artichokes -- all wonderful, yummy ingredients for savory dishes (or eat the spinach raw in salads and as a substitute for lettuce in sandwiches). 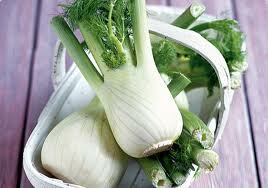 Click here to read an article about the NINE SUPERFOODS OF SPRING and why they are such nutritional powerhouses. If you find it hard to follow some of the healthy-eating advice, such as how we should eat more kale or quinoa or lentils, here's some interesting advice from Real Simple magazine. 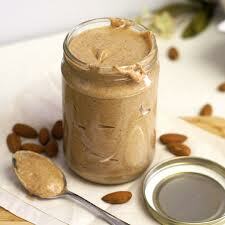 It's from an article called "The Healthy-Diet Foods That Health Experts Really Eat." 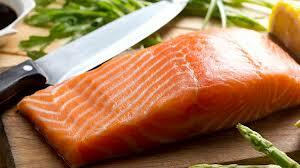 The list includes almond butter, frozen grapes, salmon, yogurt, apples and chocolate milk. Click here to read the whole list.